I choose Love as my fighting force! The messages are clear. The emotions are sincere. The urgency is present. Our nation stands at a crossroads, a moment that will be written in history, a moment where we define ourselves by our fears, or we define ourselves by our love and our humanity. Unfortunately, the state of Arizona has been exemplary in demonstrating how far the sentiment of hate and racism can go. SB 1070 was a bill that was signed into law on April 23, 2010 by Arizona Governor Jan Brewer demanding law enforcement to stop, question and detain those who are “suspected” of being undocumented. Residents of Arizona are forced to prove their legal status when racially profiled by police officers. It makes it a crime to look for work, or offer a ride to someone who may be undocumented. The last time someone in this country had to carry paperwork to walk this land was 1863, before Emancipation Proclamation. During the week that Arizona state legislators passed SB1070, nine university students chained themselves to the state capitol’s building. Over 11,000 letters, and over 80,000 petitions had been sent to the governor and legislators to prevent the passing of SB1070. A vigil began after the arrest of the students. Two days later, on April 22, a bus from Los Angeles arrived to Phoenix with 56 students, elders, and organizers, including myself, to demonstrate our solidarity with the people of Arizona. I have been a community organizer since the age of seventeen. I became politically conscious and active through my involvement in Gardena’s High School Task Force. I I learned to become an advocate for myself, whether it was in taking a personal stance to not engage with drugs as a teenager or take a political stance against Proposition 21, a law that enacted the mass incarceration of youth in California in 2000. At 27, I am still a community organizer taking political stances, standing up for my personal freedoms. When I jumped on a bus to Arizona, I went with love as my guiding emotion to fight and stand up against this racist law that was written to hurt someone like myself, a person of color. When I arrived in Arizona, I was caught by surprise at the love that was expressed in return by over 2,000 high school students that walked-out of eight different schools in Phoenix that Thursday morning. 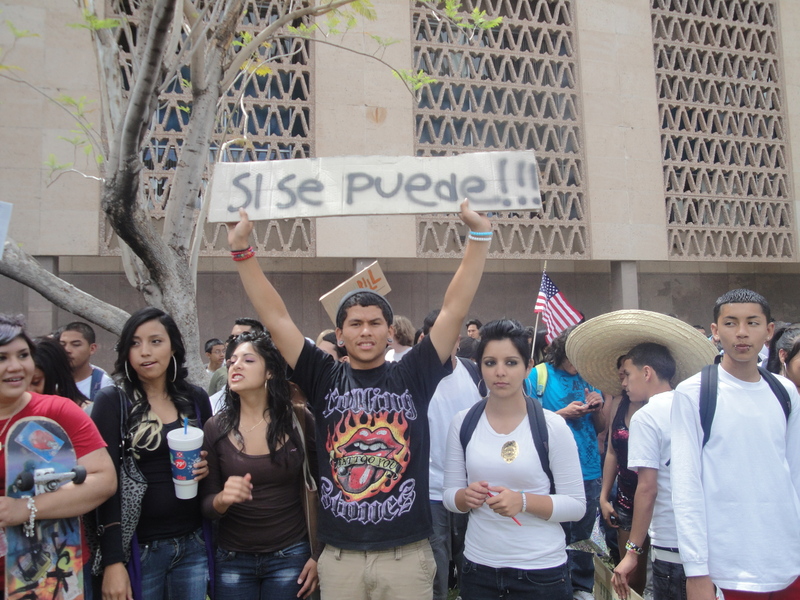 “Arizona, we got yo’back!” and “La lucha sigue, el pueblo vive!” where my statements on a megaphone. And when I looked into the eyes of Arizonians standing up for their human rights, we cried together and thanked each other for believing in one another and for believing in the movement. The teenagers that walked out on April 22 are my heros. Even though they were sincerely afraid to step out of the gates of their schools, they found courage amongst each other, inspiring one another to take the risk. At the state capitol, students from the different high schools shared their personal testimonies. They were speaking out for their parents, themselves, and discovering their voice and power. This movement that we are witnessing is driven by many factors of love; the want to raise a family, maintaining a commitment to work arduously, accomplishing educational dreams, simply creating a better future for self and community. Will this country continue to arrest and deport those of us who hold these dreams and ambitions or will this country acknowledge the human right to pursue our life, liberty, and justice? SB1070 will come into full effect on July 28, 2010, ninety days after its signing. The ACLU and MALDEF have already committed themselves to fighting this law in the courts, proving its unconstitutionality before it is implemented. Discrimination on the other hand, does not have to wait to be implemented. History will judge Ms. Jan Brewer and the legislators of Arizona for allowing racial profiling to be a lawful reality in their State. But the massive politicization and consciousness of an entire generation of youth has been set into play. This law has awaken the minds and consciousness of an entire generation of young people. The politicization that has taken place as a result of this law is irreversible and empowering for our future. When I was in Arizona, we celebrated “nuestro encuentro”, our gathering. Abolition and Civil Rights were not won overnight, it took a movement and a whole generation. In this moment, our human rights are at stake, and this generation is taking part in the movement. We can all be in solidarity, we can all boycott businesses in Arizona, we can all speak out. If a 17 year old in Arizona can do it, so can we. And so the question is asked, “Se Puede?” Can we do it? Can we disobey immoral laws, the way Martin Luther King Jr. disobeyed them? In the spirit of Rosa Parks, will we refuse to be moved from our God-given human right to work or go to school without being arrested? Can we? If you listen, you will hear the answer… SI SE PUEDE! YES WE CAN!